Nick Carter of UxC shares details on the uranium market, including supply/demand dynamics and where prices may be headed. 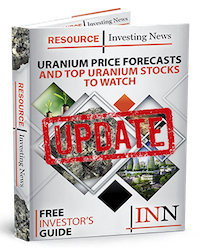 Optimism about the uranium sector continues to run high, but whether prices repeat last year’s solid rise remains to be seen. Speaking at the recent Prospectors & Developers Association of Canada (PDAC) convention, Nick Carter of UxC said he expects prices to “trend a little bit higher” in 2019. Under Section 232, the US would require 25 percent of the uranium used by utilities in the country to be supplied domestically. The Department of Commerce is expected to make a decision next month, at which point it would be passed on to the president. “I think once that’s announced we’ll have a little bit more clarity in terms of where potentially price may be headed and whether there’s a tariff or a quota situation on US uranium,” said Carter. He emphasized that investors should exercise caution, saying that prices will likely move upward more slowly than they did after bottoming out at US$18. “I think [prices] still can push up, but it’s going to be much slower growth than what we saw previously,” he concluded. Watch the video above for more from Carter on uranium supply, demand and pricing. You can also click here to view our PDAC 2019 playlist.